Are you looking at ways to make your home a happier place? We have some simple ideas that will boost your mood! From a simple splash of paint to choosing comfortable furniture and lighting ideas. 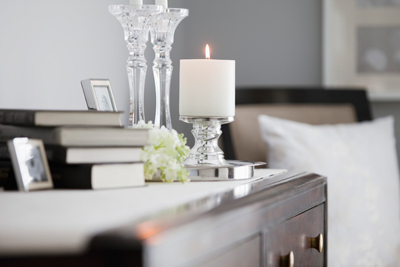 We share our advice on creating a more cheery, inviting home for you and your family. The key word is appealing! Home decor is often viewed as simply a matter of aesthetics — what looks attractive. Experts in colour psychology believe that the colours used to decorate your home can have a profound effect on the emotional well-being. 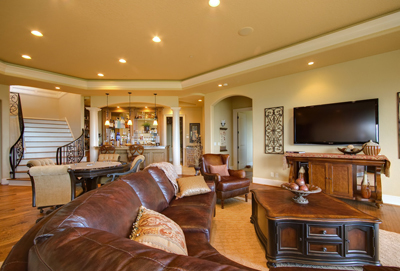 For living rooms, we advise warm tones like reds, yellows, and oranges, and earth tones like brown and beige as studies because they’re thought to stimulate conversation. For the kitchen space, colour consultants say that if you have fond memories of spending time in the kitchen, then it makes sense to recreate the colour scheme in your grown-up kitchen. Interesting. Bad lighting will equal bad moods. Choose lamps with personality and style and enjoy a sunnier disposition (pun definitely intended). Round shapes, especially in the living room area will make a space feel more inviting. They soften a room and make a house more lovable and liveable. Your home should be a reflection of who you and your family are. It should speak volumes about what you love, the things you enjoy doing, the places you have visited, and the experiences you’ve shared. It is important for your home to tell your story. This makes it a true personal reflection of you. The smaller the room, the more drama you need! Choosing a colour scheme for a small room is a perfect opportunity to be fearless. Large rooms require an equally large investment—litres and litres of paint and the labour required to roll it on—your outlay for a small bedroom or foyer is minimal. So go ahead: pick a color that you really like, and go for it! Do you need help weather proofing your home? Our qualified handyman can assist you, so don’t hesitate to give Hire A Hubby a call on 1800 803 339. Alternatively, explore our website www.hireahubby.com.au or get an obligation free quote here!